Simple enough to look great anywhere, with enough charm to make a statement, it's not a surprise why so many have chosen our Vintage Shaker Bed for their homes. 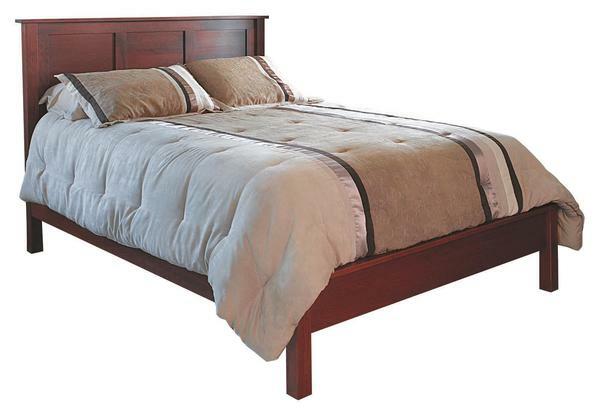 Bench-built from solid hardwood, with clean lines, straight edges, and big flat panels that showcase the natural beauty of the wood, this bed holds true to the Shaker style to offer warmth at the heart of any suite. Above, a large three-panel headboard provides the perfect backdrop to your bedding, while also giving you a place to prop your pillow when reading or catching your favorite shows before bed. Below, a classic low footboard is surrounded by to square feet, joined together with a solid-wood side rail system to provide a lifetime of stability. Through the options, make our Vintage Shaker Bed just what you're envisioning by choosing from an array of size, wood, and finish combinations to get just the right one for your unique decor. Or, call one of our furniture specialists today to answer any questions and help you start your order by phone. We have stain samples available to help you make your finial decision if you're torn between different stains. Floor to Bottom of Siderail: 8 5/8"
Floor to Top: 14 5/8"
Floor to Bottom: 8 5/8"